Released into theatres eleven months after Robert Altman's M*A*S*H turned the director into a household name back in 1970, the wildly free-flying Brewster McCloud took the filmmaker's experiments with classic movie structure to even greater extremes with this self-consciously goofy, slapstick and nonsense infused trippy motion picture experience. And aside from the words of critics like Vincent Canby and Roger Ebert, I have no idea exactly how audiences reacted to such a bizarre yet oddly fascinating work forty years ago. 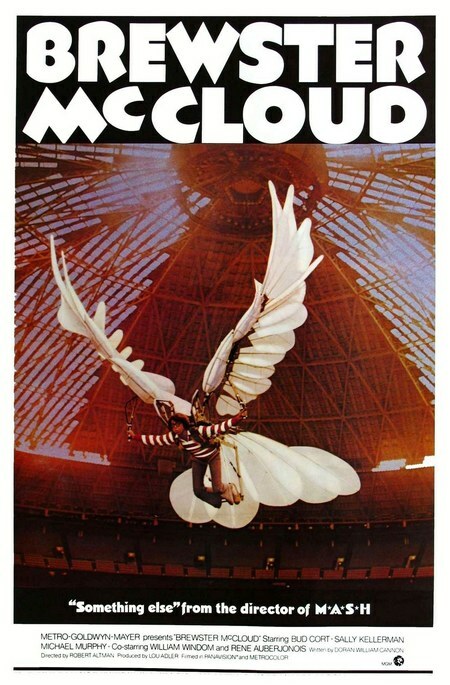 However, I can say that to fully appreciate Brewster in the scheme of the way it helped cement the filmmaker's unique style and method of presenting information onscreen, it's quite beneficial to have seen a fair share of Altman's movies before you attempt to soar like a bird through the Houston Astrodome along with Bud Cort's titular character. The first film to feature one of the director's most cherished and often utilized actresses, Shelley Duvall, Brewster McCloud which just landed on DVD thanks to the Warner Archive Collection is classic Altman right from the beginning. From its bold decision to insert a line of dialogue instead of the MGM lion roar along with its joyous anti-establishment credit sequence that gets interrupted by a character's insistence to start again to the filmmaker's trademark wandering camera, we move around the film's Houston landscape in search of a plot, following more than a dozen characters, each of whom are stranger than the previous one. Although some characters vanish fairly quickly, the main players consist of the odd eponymous hero who is training himself to fly like a bird, Brewster's possibly murderous guardian angel Louise (Sally Kellerman), his new daffy Astrodome museum tour guide love interest Suzanne (Duvall) and Michael Murphy's Bullitt inspired San Francisco detective Frank Shaft who is invited to Texas to help catch a strangling serial killer who may indeed be Louise. Yet to simply focus on that particular quartet isn't enough for Altman who likes shaking things up with more roles for supporting players than you can find actors to inhabit including a bird expert lecturer, an evil landlord whose wheelchair spirals out of control in one of the film's first outrageous chase sequences set on the Texas roadways, a health food store employee who gets turned on by Brewster's chin-ups, along with more police and local politicians. And while it needs to be said that the film isn't always coherent, it is always compulsively watchable, even if unlike that lusty health food store worker, we find ourselves turned off by the frequent usage of bird droppings and other tasteless jokes. Similar to other Altman efforts of his prolific '70s era, it's hard to give a solid recommendation of the film to the average movie fan especially if they haven't seen some of his decade masterworks like Nashville, M*A*S*H and The Long Goodbye but if you're an adventurous viewer who loves their auteurs, you'll definitely want to give Brewster at least one chance to fly in your living room.